Body Transformation: From Round To Ripped! 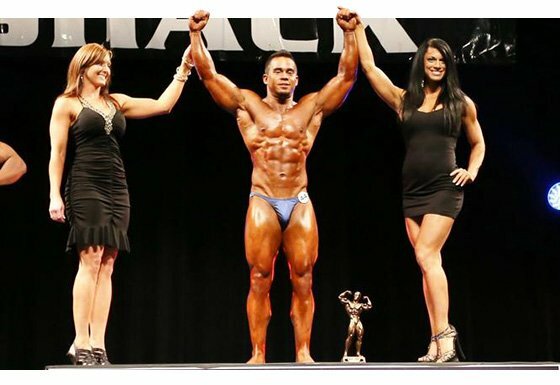 Ricky abandoned Cajun feasts for healthy food to fuel his competition goals. See the diet and training plans that cut 19 percent body fat from his physique! I didn't realize how much body fat I gained and how much muscle I lost until I flipped through my old high school photos. I had been in college for four years and never worked out or followed a diet. I used herniated discs from a military injury as an excuse to avoid physical activity and ballooned up to 185 pounds with 27 percent body fat. I tried to get back into the gym many times, but lacked motivation and determination. On May 17, 2011, I finally got tired of being overweight, weak, and unfit, and decided to do something about it. I was willing to do whatever it took to make a change. Living in Cajun country in Southwest Louisiana isn't easy because my family cooks Cajun foods constantly (gumbo, red beans and rice, boudin, sauce piquante, crawfish etouffee, etc.). My family learned to understand that I wasn't being rude to deny their favorite dishes. I ate six meals per day and prepped them ahead of time, which my wife likes because I usually make some for her so she doesn't have to cook. We have an agreement that I do the cooking and she does the cleaning, which works well. My life is much different now. My wife and I like to travel and we prepare enough meals to make it though a trip. I spend less money and eat more than ever and have a health-conscious mindset. The biggest difference is my attitude toward myself. I used to be unhappy physically, which affected me mentally. Since graduating college, I'm in a better place. I have the start of a good career, bought a house, met my goals to get fit and thank God that I'm able to wake up every day and enjoy it all. When I first tried to get back into shape, I hit the gym hard, but didn't have a good diet or cardio plan to achieve my goals. I quickly discovered that getting fit involved more than hard work in the gym. I spent hours researching and reading on Bodybuilding.com to create a training and diet plan. During the first couple months, there were negative days when I wanted to quit due to a lack of motivation and negative thoughts. I'm thankful for my friend, Wesley, who pushed me to work out for the first couple months. My wife took my progress photos every few weeks and I made small adjustments to keep seeing progress. It was motivating to see my body change. After I saw small changes, I abandoned my old ways for good. I found inspiration in the negative comments I received in the past and kept focused on a new and improved Ricky. The first day I started to eat clean and cook my meals was May 17, 2011. I spent the rest of 2011 and a couple months of 2012 bulking to put on muscle. I was helped by muscle memory because I was stout and strong in high school. I cut down to 12 percent body fat by summer 2012 for a cruise and told my family I would compete by summer 2013. From July 2012 to January 2013, I bulked with competing as my goal. I put on solid muscle and got up to 20 percent body fat. I kept telling myself that it was all part of the plan. On January, 5 2013, I started to diet down and preserve as much muscle as possible. On June 15, 2013, I met my goal and competed for the first time. I weighed 162 pounds with eight percent body fat and placed second. I do 45 minutes of fasted low-intensity cardio in the morning and 45 minutes of low-intensity cardio in the afternoon. Dieting challenges me. It's not easy to eat clean food because you always have to prepare ahead of time and weigh out servings. It's not easy to pass up on good-tasting, unhealthy food. I'm a fat kid at heart and love food, but know if I want to look the way I do, I have to eat right. I work with a tight-knit group of guys who like to place boxes of doughnuts in my cubicle to see if I'll eat them. I learned to be disciplined enough to pass it up. I've far surpassed my original goal to get back in shape. This offseason, I plan to bring up many weak areas and add 6-8 pounds of muscle. I'm working with NPC competitor Paige Russell on my diet and workout routine. I wish there was someone I could've listened to when I started instead of working through trial and error. People think there's a magic pill to get fit and don't like to hear the truth. You can take everything under the sun, but if your nutrition and training aren't right, no changes will happen. Don't lose sight of your goals because nothing is impossible. No matter how out of shape you are, it's never too late to make a change . I recommend setting short- and long-term goals. Find what motivates you and use it to drive you, but have a plan and a reason. Bodybuilding.com's workout section helped me build a better routine. I read lots of Layne Norton's articles on contest prep. He's very knowledgeable and knows the science and facts about his points. Most of all, I was able to order supplements at the best prices and get them shipped quickly.